Below is a collection of common billing and subscription questions and answers our customer service team handles. Simply click the question and the answer will be displayed. If you still have additional questions, please call our customer care team at 844-858-9332 any weekday between 9am and 5pm Eastern Time. What is the automatic renewal program? How do I cancel my automatic renewal benefit? How do I find my premium reports and any back issues? Why am I seeing unknown charges? What is PSV*The Altucher Report? What is PSV*Altucher's Crypto Trader? What is PSV*Top 1% Advisory? 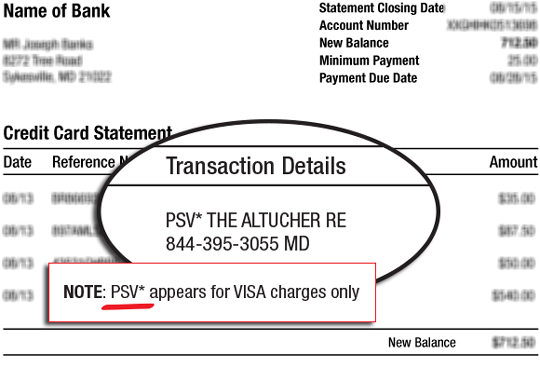 What is PSV*Altucher’s Secret Income? What is PSV*Altucher’s 420% Syndicate? What is PSV*The Choose Yourself Guide to Self Publishing? What is PSV*Profit Line Alert? The automatic renewal program is the most convenient way to maintain your subscription. Instead of having to renew every month or year (depending on the research service you receive), your credit card is charged automatically. This ensures that you don’t miss out on a single alert or research report. It also allows you to lock-in your subscription price for as long as you like, even if the price increases in the future. If you’re currently set up for auto-renew, below is an example of what the charge may look like on your credit card statement. The charge will coincide with the research services you receive. This example is for The Altucher Report. Login to the website and navigate to the publication archive. At the top will be tabs where you can easily find your premium reports and any back issues. Please call us at 1-844-370-6599 if you’d like to cancel your subscription. That’s great! Please email me at support@chooseyourselffinancial.com and I will endeavor to answer any questions either directly, in a future newsletter, on a Twitter Q&A or in my “Ask Altucher” podcast. In the event that you should need to cancel your subscription, please contact Customer Service at 1-844-370-6599 to speak to a representative. You can also email Customer Service directly at support@chooseyourselffinancial.com to take care of removing you from the list. Our billing and offer terms are outlined on the original order form you fill out before becoming a subscriber. You will also find these same terms in the email confirmation you received after your order was fully processed. Many of our subscriptions are NON-REFUNDABLE, so please make sure you’re aware of your specific policy. Below is an example of what your order form confirmation looked like. The area where the billing and offer terms are outlined is circled in red. You do not recognize the company or name of the subscription you ordered. A full list of subscriptions and descriptors are located on this page. A majority of our subscriptions come with convenient automatic renewal, so there is no chance of interrupted service. This means that at the end of your free trial or subscription term, your credit card will be billed automatically under the original billing terms. If you’d like to remove your subscription from automatic billing, please email us at support@chooseyourselffinancial.com and we’d be glad to stop any future charges from occurring. An order was split into multiple payments over an agreed upon price and term length. It’s because you have subscribed to one of Choose Yourself Financials’ memberships called The Altucher Alliance. The Altucher Alliance is a membership that contains access to every publication we offer. The Altucher Alliance is James Altucher’s membership service designed to provide you with each and every pick, idea, income opportunity and investment strategy he has to offer, for life. Editor James Altucher is an entrepreneur, author, financial writer, venture capitalist, angel investor, podcaster and former hedge fund manager. His book The Choose Yourself Guide to Wealth is a Wall Street Journal best-seller. Outside of Choose Yourself Financial, his work has been featured in the Financial Times, the Wall Street Journal, Yahoo Finance and Forbes. Email us at support@chooseyourselffinancial.com and one of our Customer Service Representatives will get back to you as soon as possible. It’s because you have subscribed to one of Choose Yourself Financials’ financial newsletters by the name of The Altucher Report. The Altucher Report is a monthly newsletter written by James Altucher. He delivers updates on emerging income opportunities that can make you a fortune for a secure and happy life. And ways to develop your idea muscle so it turns into a machine. It’s because you have subscribed to one of Choose Yourself Financials’ financial newsletters by the name of Altucher’s Crypto Trader. Altucher’s Crypto Trader is an investment newsletter written by James Altucher. Each week, James and his team will track the markets to find the cryptocurrencies worth investing in. It’s because you have subscribed to one of Choose Yourself Financials’ financial newsletters by the name of Top 1% Advisory. Top 1% Advisory is a monthly investment newsletter written by James Altucher. This service is the culmination of James Altucher’s more than 20 years’ experience on Wall Street as a private investor, hedge fund manager and author. It’s a way of staying in touch with the world of professional investors and it offers James a unique, powerful tool to inform his own investments. It’s because you have subscribed to one of Choose Yourself Financials’ financial newsletters by the name of Altucher’s Secret Income. Altucher’s Secret Income is an investment newsletter written by James Altucher. His goal is to make the world of selling options as simple as possible for you. His focus is on special situation stocks. It’s because you have subscribed to one of Choose Yourself Financials’ financial newsletters by the name of Altucher’s 420% Syndicate. Altucher’s 420% Syndicate is an investment newsletter written by James Altucher. Each week, James and his team will track the markets to find the marijuana stocks worth investing in. Call our Customer Service team toll-free at 844-858-9332. It’s because you have subscribed to one of Choose Yourself Financials’ courses by the name of The Choose Yourself Guide to Self Publishing. The Choose Yourself Guide to Self Publishing is an online self-publishing course written by James Altucher. It’s because you have subscribed to one of Choose Yourself Financials’ financial newsletters by the name of Profit Line Alert. Profit Line Alert is an investment newsletter written by James Altucher. Each week, James and his team will use his special algorithm to find stocks that hit the “Go-Zone”.